Price per bottle - 16 fl. oz. Bee Propolis increases the natural skin-soothing and cleansing properties of the Aloe Vera Gel. Allantoin is a beneficial ingredient found in many plants, including aloe. Eleven carefully selected plant extracts, also known for their beneficial properties, complete this powerful formula. The combination of aloe and herbs provide a naturally soothing, pH-balanced spray that is easy to apply to even sensitive skin. 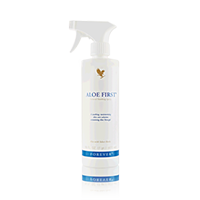 Aloe First® is designed to soothe the skin after minor cuts, scrapes, burns, and sunburn. Other uses for Aloe First® include spraying on hair to help ward off the elements. It is even used in some hair salons as a pre-perm solution, as it helps combat the drying effects of perming solutions. Aloe First® is especially soothing after waxing.